In the family of monophonic analog synthesizers (monodic, only one voice), the minimoog is in the Hall of Fame. In the 70s, it is he who popularized the use of the synth thanks to the ease of use versus the modular of the time. It was the first "non-modular" synth - modular prepatched for some people - portable with built-in keyboard (44-note keyboard). There were 4 versions of the minimoog, from model A to D. Only the latter had a commercial destiny from 1970 to 1981. In May 2016, Moog Music announced a limited edition reissue of the model D minimoog. A year later, in June In 2017, Moog Music declared that it was putting an end to the production of the Model D moog reissue. The D model is over 40 years old, which means that its design, scheme and design are in the public domain. Thus can be copied without falling under the use of patents without licenses, license agreement or payment of royalties. The Behringer Model D is an analog subtractive synthesis synth taking over the basic diagram of the minimoog Model D. The Moog is with a keyboard but the Behringer without. It is therefore an expander, this one desktop. The flanks of the Model D seem to be made of wood or composite (WPC? ), A wengue type of 5mm tinted mahogany. I did not give a saw or emery paper to check the material… The Behringer is not at the 1:1 scale of the original Moog. A minimoog is wide almost 73 centimeters. The Eurorack chassis of the Behringer Model D is almost half less : 38 centimeters. 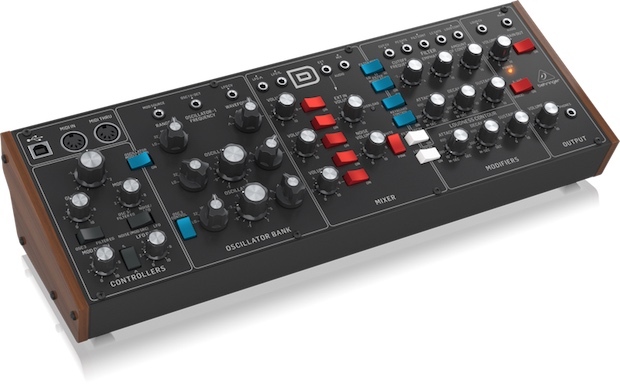 There is therefore a reduction of the control panel : the buttons are smaller, but arranged in five sections in the same way as on its model Moog : CONTROLLER, OSCILLATOR BANK, MIXER, MODIFIERS, OUTPUT. They are sufficiently spaced to be able to turn them without being inconvenienced by the proximity of other buttons; a good point. Potentiometers don't waddle under the maneuver, and the selectors are firm; even a little stiff. According to Behringer, the electronic circuit is based on paired JFET transistors. The analog signal follows the classical VCO, VCF et VCA path. The TUNE knob controls the overall tuning, the frequency of the oscillators. To tune the Model D to A3 — by ear — I turn on the internal generator by switching ON the red A-440 switch located in the section OUTPUT and I turn the TUNE knob. Note that the TUNE button does not act on the OSC3 if the blue switch OSC3 CONTROL of the section OSCILLATOR BANK if it's not ON. If the OSC3 CONTROL switch is on, the frequency of the OSC3 varies with the keyboard and controllers. Otherwise the keyboard and pitch-wheel and modulation have no effect on this third oscillator. The GLIDE button is used to "drag" the note, the pitch, gradually from one key to another. The knob turned to 10 do a glissando effect very long. At zero there is no more transition effect between two notes. GLIDE is also called Portamento on other synths. The Glide is properly used when the note priority is set to LAST-NOTE-PRIORITY (priority to the last note played). Otherwise I think the Glide is not too exploitable; it's my choice. The MOD MIX button in the section CONTROLLERS Adjusts the balance between the modulation sources selected using the black OSC3/FILTER EG and NOISE/LFO switches. When the MOD MIX knob is turned completely to left, only the modulation source selected by the OSC3/FILTER EG switch is applied. And when MOD MIX is turned all to the right, only the modulation source selected by the NOISE/LFO switch is applied. In the intermediate position, the two selected modulation sources are mixed. Using the modulation wheel can introduce more complex filtering effects, for example by setting the black NOISE/LFO switch to LFO, the FILTER MODULATION blue switch from the MODIFIERS section to ON, and turning the MOD MIX knob to 10. In the OSCILLATOR BANK section In the OSCILLATOR BANK section there is a 6 waveform selector for each of the three oscillators with six octave selections from "LO" (64 "?) To 2". This first selection "LO" lowers the frequency in the extreme low (TBF), allowing the oscillator to be used as a source of modulation (about 5 to 40 Hz). The wave chosen for each oscillator may be different: triangular (Triangle), sawtooth for OSC1 and OSC2 (Sawtooth), inverted sawtooth for OSC3 (Reversed Sawtooth), sawtooth, square (Pulse 1) , pulse average (Pulse 2), pulse short (Pulse 3). You can not modulate the pulse width (PWM). A FREQUENCY-ADJUSTMENT ("Detune/Fine tuning") button for OSCILLATOR-2 and OSCILLATOR-3 allows tuning to unison or adding thickness to the sound (when two or more oscillators are active). Each FREQUENCY-ADJUSTMENT knob is graduated in semitone. This allows you to add a third, fourth or seventh for example to form a chord to "the eye" it will better adjust by ear (or with a tuner for demanding man). Also, a simple minimal discrepancy of the three oscillators makes it possible to pulse the sound. The LFO is square wave or triangle. It modulates the pitch of the third OSC3 oscillator or the Cutoff of the FILTER EG filter. The resonant filter can be low pass or high pass with the classic attenuation of 24 dB per octave (4 poles), the famous moog cascade, four 6dB/octave filters in series. As on the original, is present a pink or white noise generator mixable with the wave oscillators. The EXT IN VOLUME knob adjusts the level of the external source connected to the EXT. If no cable is connected to the EXT. Input, then the main audio output from Model D is routed to this external input. In this case, the main output signal is fed back into the input of the MIXER section, and the control of the external input volume is after volume control of the main output. This means that the MAIN OUTPUT VOLUME knob will affect the amount of saturation in addition to the EXTERNAL INPUT VOLUME knob. By increasing the volume of the external input, the mixer can saturate, thus introducing Overdrive or Distortion. When this happens, the OVERLOAD indicator blinks. In the MODIFIERS section In the MODIFIERS section there is a new switch: FILTER MODE. This selects the type of filter : low pass or high pass. The high-pass filter is an innovation compared to the minimoog. The envelope "EG" of the VCF and VCA is ADS type : Attack time, Decay time, Sustain level. No release time knob, it was done in a clever way. After the execution of the attack and decay times, the sustain phase keeps the sound at the set level (between Ø and 1Ø). When a depressed key is released, the sustain gives way to the "Release Time" which occurs for the same duration as the initial Decay. If the LOUD DECAY and/or FILTER DECAY white switch is ON, the sound switches to the "Release" phase according to the DECAY TIME setting when a button or an external trigger is released. Otherwise the sound is cut, there is no release. The two blue KEYBOARD CONTROL switches in the MODIFIERS section allow you to vary the intensity de suivi de clavier "keyboard tracking" — also called "key follow" by other brands — which modifies the filter cutoff according to the pitch of the note played. Switches 1 and 2 OFF : keyboard tracking is disabled, switch 1 only ON : 1/3 effect, switch 2 only ON : 2/3 effect, switches 1 and 2 ON : the effect is maximum. In the OUTPUT section section, a 3.5 stereo headphone jack is available on the front panel, as well as the MAIN OUT main output on unbalanced 3.5 TS Jack (mono signal). This one can be useful in case the Behringer Model D is mounted in a rack. Thus its output can be patched to another Eurorack module. There is the red switch A-440 to activate the generator of A3 at 440 Hz. It also allows to configure the Model D during the warm-up phase (see paragraph "Special Modes" in the section "Step 3 - Implementation "Quick Start Guide for more details). The audio output jack 6.35 TS is at the back. It is duplicated to provide a low level (instrument) and high (line). Warning, these are not audio output left "L" and right "R"! Also in the back is a 4-way DIL microswitch. This selects the MIDI channel of Model D (1 to 16). The 12V DC power supply is provided by an AC adapter. The power switch is on the back. The Behringer Model D is semi-modular — in a rudimentary way — with "CV" points (Control Voltage) : seven inputs (MOD SOURCE, OSC 1V/OCT, CV LFO, CUT CV, FC GATE, GATE LC, LOUD CV) and four outputs (LFO Λ (Triangular), LFO Π⅃ (Square), FILT CONT, LOUD CONT), also an EXT audio input to process sounds from an external source, and two audio outputs : MIX and MAIN; all in TS 3.5 mm jack. The Behringer Model D is delivered with two patch cords (3.5 TS jack) about twenty centimeters, one black and one white. Is it the little one that has sound ? Does he have sound ? Is there a difference with the minimoog Model D Moog ? Already, I heard that there were differences from one Moog model to another, the craft construction and the tolerance of the analog components of the 70's being involved. The age of the minimoog and therefore of all its aging electronic components modifies its characteristics and specifications. For the same sound, the settings from one minimoog to another may be different, sometimes with a timbral variation. Between a Model D by RA Moog of 1971 and its reissue 2016 by Moog Music there is a difference, not only technical or aesthetic; it is the sound, the timbre (a difference of "fat" and/or "brightness"). However, all have the same clearly identifiable sound signature. The Model D Behringer sounds minimoog, I have no doubt about it, even if my hands and ears have touched and listened to a real minimoog a long time ago. And to realize it, it is enough to take again the Patch Sheets (PDF 16,1 Mo) edited by Moog for the minimoog Model D and to apply them to behrimoog to hear it. A minimoog does not know how to make only bass. He also excels in lead and patches for soft soloists, captivating or aggressive and furious, sound effects, effects and strange sounds. Now I can play and explore The minimoog Sound without spending a few thousand euros for a used and tired "Vintage" version on an auction site or a minimoog Model D nine reissue 2016 by Moog Music worth ten times the price of Behringer Model D. First, the sound is clean, no breath. The bass is rich and mellow, the mediums are very present, and the highs brilliant (without aliasing, hihihi! ), as only the analog can do it. The envelopes are fast. The 4-pole 24dB/oct. filter with resonance is formidable. It may be self-oscillating and incisive. The high-pass filter opens new horizons in sound design. Modulations are diversified. And there is the tactile pleasure, a button equals a function… However, I think that a frequent user of minimoog will make the difference (compared to his machine and not another of course). The minimoog is a reference in the world of Electro music, but also Rock, Pop, Progressive, Symphonic Rock, Jazz, Fusion, R&B, Soul, Trip-Hop, Rap, Funk, even Variety, and so on, practically all musical genres. It is or was used, in disorder, by Pink Floyd, Krafwerk, Peter Bardens, Gary Numan, Klaus Schulze, Herbie Hancock, Manfred Mann, Patrick Moraz, Frank Zappa, Jean-Philippe Goude, Vince Clarke, Tim Blake, Radiohead, Depeche Mode, Moby, The Chemical Brothers, The Crystal method, Air, Daft Punk, Dr Dre… Impossible to name all the musicians who have used the minimoog. Note the memorable minimoog bass in Thriller by Rod Temperton (singer Michael Jackson), without missing the rock opera Journey to the Center of the Earth and Art-Rock The Six Wives Of Henry VIII by Rick Wakeman, as well as the classic Pictures at an Exhibition by Emerson, Lake & Palmer (ELP) and Switched on Bach by Walter/Wendy Carlos (Modular Moog used). Yes I know, it's old all that ! Robert Moog has inspired many designers and manufacturers with this minimoog, the most iconic synth in the world. up to 16 voices "MIDI Poly Chain"
This switch is used to mute the MAIN OUT main output without the need to turn the VOLUME knob to zero. Muting the main output allows the synthplayer with a headphone connected to the PHONE 3.5 jack to set a new patch or tune the Model D without anyone hearing. When multiple triggering is enabled, each new note that is produced, sends a trigger information to the VCF (Filter contour) and VCA (Loudness Contour) envelope generators. By disabling multi-trigger (Legato mode), Contour Generators will only launch if all notes are released before a new note is played. The legato mode allows you to play a new note while the previous one is not released. The note pitch changes only without the envelopes being triggered again. The new note is understood in the temporal continuation of the outline produced by the note which launched it. To trigger the envelopes again, you have to untie the notes, play Pizzicato. The color code of the toggle switches used by Behringer is not the same as that chosen by Moog. Here is the meaning. Red switches :Activation of audio sources. Blue switches :Connections of modulation sources to destinations. Black switches :Modulation source selectors. White switches :Activation of performance features (effects). Nota: There is no white GLIDE switch. Switch [A-440] ON generates a reference signal at 440 Hz. It also allows the unit to be placed in different modes during the power up phase. During the first 5 seconds after switching on the Model D, it is necessary to operate this switch a certain number of times. The Power LED flashes to indicate the mode of operation or configuration: multi-trigger (legato/pizzicato), priority of the notes: last/low/high, polyphonic string. For details, see the Model D user manual. System Exclusive MIDI messages (SysEx) allow you to configure the MIDI channel, the modulation sensitivity curve, or the Pitch-Bend half-tone range, for example. SysEx commands are indicated in the user manual of the Behringer Model D.
The case of the Behringer Model D can be removed and the synth placed in a Eurorack system. The Behringer Model D comes with a "Eurorack Power Cable 16/10pin-15cm" with a "10-point" connector for the X23 connector on the Model D motherboard. The red MAIN OUT switch only mutes the sound of the output. This is not the power switch of the Behringer Model D (read "tricks and tips" above). The MIDI implementation is minimalist: note ON, note OFF, Pitch Bend, Modulation. The appearance being identical to the original but this Model D being a new interpretation of the minimoog, would not it have been more judicious to name this Behringer Model E, "e" as Evolution? Like the minimoog, it is recommended to power on and let the Behringer Model D heat for 10 to 15 minutes before using, see more if the device was cold. This allows the electronic components to reach their normal operating temperature and stabilize. This is necessary for the tuning to be reliable and constant for a moment. However, it will be necessary to adjust the general TUNE and TUNE OSC.2 & 3 setting again if the session, training or performance lasts long. Want to listen to the Behringer Model D demos? Then click the button below. See proceedings of tests and reset of Behringer Model D.
Page modified since 7 months, thursday at 20h44mn.